My name is Mahesh Sarki, I’m from Nepal. I’m specializing in Public Health Nutrition and Food Policy and currently in fifth semester of the education. One of the requirements of education is that each student from the university have to go for an internship related to health and could be anywhere in the world. I was fortunate enough to get my application accepted in two institutions in Nepal and picked the most suited place. Nutrition Promotion and Consultancy services (NPCs), a non-governmental organization, gave me an opportunity to exercise my theoretical understanding, reflect on my learning and gain experiences from the expertise at the Institution. I spent majority of my internship period in carrying out baseline nutrition survey: right from ethical approval to report writing. I was prepared to work in slums of Kathmandu, the capital of Nepal, but things changed and was given a new responsibility in a different context which felt quite uncomfortable in the beginning but I accepted the challenge and successfully accomplished the task. Firstly, we had to design a questionnaire form, outline of the topics from which we wanted to asses local people’s understanding on health and nutritional knowledge. Residents were assessed on Food Security, Food Safety, General knowledge on Health and Nutrition, Anthropometric measurements and Body Mass Index of women. Getting questionnaire ready for the survey was quite tough because of differences in ideas, understanding and viewpoint but the competences that I have developed from the group work and group assignments at Metropol had really shaped me to accept and listen to others’ views, which made it a happy ending by finalizing questionnaire form for the survey. Had I never been to exposed to mutual working environment, it would have definitely been much harder. Due to time constraints, we could not design a completely new questionnaire form but many new questions were added to the already existing questionnaire form. Moreover, researching skills I had learnt obviously engendered me to design ethically sound, less technical and digestible questionnaires. Beside the use of theoretical concepts from the education, group works, presentations, case studies sustained me to feel comfortable in a new context. Measuring the height of the survey participants. Visit to Balkhu slum in Kathmandu. volunteer taking the consent of interviewee before starting the interview. Sensing the value of public participation in research we decided to employ locals as enumerators for the survey and got approval from officials even though it was quite lengthy process. Subsequently, got trained on ways on filling our questionnaire form the expertise at the institution and later trained enumerators in it and pilot tested our questionnaire form and it went smoothly. We thought we were prepared while we were in the field collecting data but we always encountered unexpectedness and had to think out of the box in relation to the context, which is bit different as to the theoretical concepts. Moreover, there were tough days in the field when we did not have enough time eat lunch, kept moving from one place to another carrying anthropometric devices in the scorching sun and always had to keep people’s convenience at the top. One of the biggest lessons that I learnt after the data collection was that theoretical things are just the guideline and things vary according to context. Therefore case studies in group assignments are building steps for predicting the possible context and are most important part of the education. 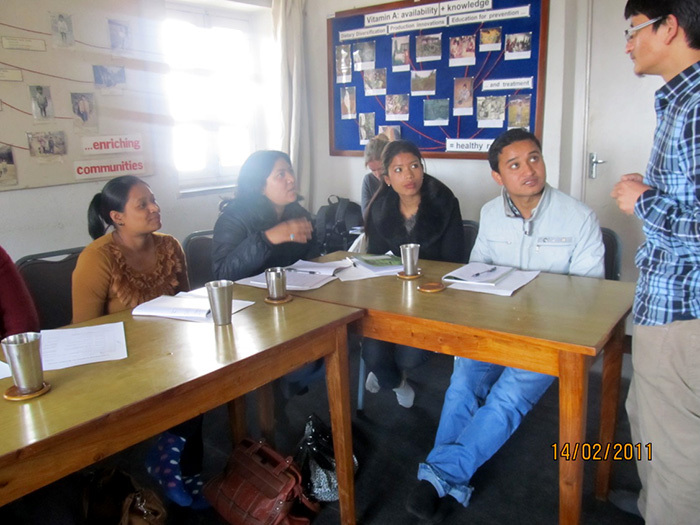 Participating in the Nutrition link person training program for volunteers from 8 districts of Nepal. Photo session with volunteers at the end of data collection. 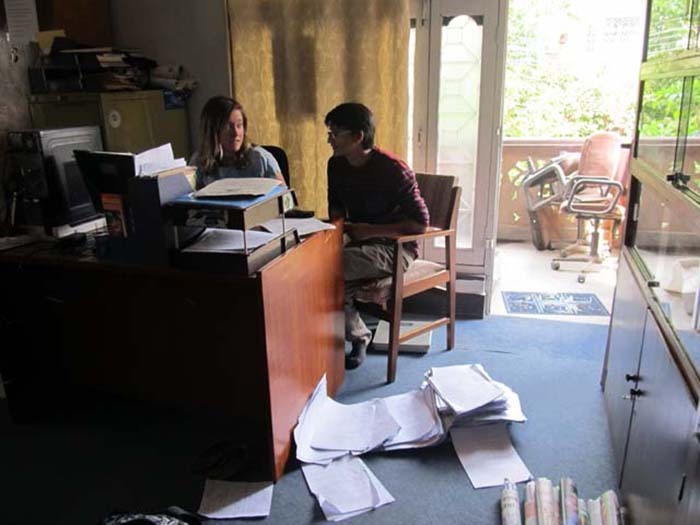 After exciting time in the field, we were back to office and went through the filled questionnaire forms so that it would be easy in data recording. Data recording was quite laborious, as we had to stay in front of computer for almost 7 hours entering the data. To add further, I was completely unaware of the software used in the analysis prior to the survey and I was bit worried that slight mis-entering would affect the result of the survey so I had to be switched on all the time while typing. Actually most work was done on the software by one of the volunteers from UK but I did majority of the data recording. Patience and concentration was hugely required and I managed to pass through quite well. Computer skills on data handling from the education were very helpful despite I was new to the software. To add further, computer software like AnthroPlus was handy in analyzing the nutritional status of children. I had always thought before starting this education that overweight is a problem of western societies and malnutrition is a problem of developing and undeveloped countries but I came to understand that developing and underdeveloped countries are vulnerable to the effect of double burden of diseases. During the last week of my internship we analyzed the survey data and got the most surprising result on the rate of overweight among surveyed mothers – I had never expected that the overweight rate would be so high and left me with surprise and remains a topic to be researched further. This has left me with a window of opportunity to be researched on if I go to the same interning place for my last internship. This has made my internship very special as I can develop on from where I left in my first internship. Discussing on how should we go ahead in data recording. One of the objectives for my internship was to participate in survey conducted by the institution but I had never thought that I would be given the whole responsibility to conduct a baseline survey; it came only after I had meeting with the director of the interning place. I was bit nervous and thought it was a lot to ask from me but I remained open minded and thought even if I make mistakes I would be assisted by other staff members from the institution and it would be the best opportunity to test my temperament, handle pressure and responsibility. In addition, I trusted my instincts and the competencies that I have added from the intercultural settings of my study and accepted the challenge. It was laborious – which is a part of profession I guess – and I enjoyed every bit of it. Staff at the interning place were always motivating, helpful and giving me feedback, which made my internship very special. It was a big opportunity for me to test my theoretical understanding as well as reflect on myself. It has given me a big boost up to perform similar kind of surveys in the future and more experience in terms of practical work, which is a way to go for the profession linked to my field of study. I am extremely elated as it went smoothly and I think I was able to deliver what was expected of me. It was first of its kind in my life, really enjoyed being in field and working with many people. I am grateful to all the people who stand up and assisted me directly and indirectly in making my Internship successful.